Welcome to Tank Riot! Tank Riot is a never dull audio podcast (a.k.a. netcast) that digs deep into the minds of Viktor, Sputnik, and Tor. Recorded in tropical Madison, Wisconsin; each show starts you on a winding audio journey with a destination far from home. So secure your helmet, close the hatch, and by all means turn up the volume. 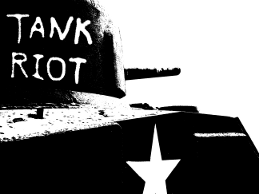 Tank Riot is available in mp3 format via a RSS feed or by download from each episode's page. Follow the links in the episode list for show details. Help promote Tank Riot! Vote for Tank Riot at Podcast Alley. Episode 195 — April 4, 2019: Tim Apple and Don Orange! Episode 194 — March 5, 2019: Mayo Bernays! Episode 193 — January 23, 2019: To the M-O-O-N and Back! Episode 172 — November 16, 2016: You Want It Darker! Episode 171 — October 12, 2016: October Surprises! Episode 170 — August 25, 2016: Kubo and the Two Suicide Sausages! Episode 169 — July 22, 2016: Stanger Things: GOP, CFAA! Episode 168 — May 19, 2016: The Return of Eugene V. Debs! Episode 167 — March 10, 2016: Video Games, Buddhism, Politics! Episode 166 — February 25, 2016: To Bowie and Apple on Encryption with Love! Episode 165 — December 16, 2015: Sacred Baby Fest! Episode 164 — November 20, 2015: Spectre! Episode 163 — October 21, 2015: Back to the Future Mars! Episode 162 — September 17, 2015: Music, Nuclear, Iran vs. I Ran! Episode 161 — July 22, 2015: Pope Francis's Global Warming Encyclical! Episode 160 — June 24, 2015: Vincent van Gogh! Episode 159 — June 4, 2015: John Carpenter! Episode 158 — May 6, 2015: Nick Drake! Episode 157 — Apr 16, 2015: Ada Lovelace! Episode 156 — March 10, 2015: Deep State! Episode 155 — February 4, 2015: Blaxploitation Films! Episode 154 — December 18, 2014: Flying Spaghetti Western Holiday Show! Episode 153 — November 5, 2014: John Wayne! Episode 152 — October 9, 2014: Midterm Elections! Episode 151 — September 11, 2014: Scientific Method! Episode 150 — August 13, 2014: Vikings! Episode 149 — May 14, 2014: Jane Goodall! Episode 148 — April 16, 2014: William Randolph Hearst! Episode 147 — March 19, 2014: Marijuana Reform! Episode 146 — February 12, 2014: Humphrey Bogart! Episode 145 — December 18, 2013: Xmas 2013! Episode 144 — December 4, 2013: Saudi Arabia! Episode 143 — November 6, 2013: Lou Reed! Episode 142 — October 16, 2013: The National Security Agency! Episode 141 — September 25, 2013: Conspiracy Theories, Part 11! Episode 140 — August 29, 2013: Huey "The Kingfish" Long! Episode 139 — August 22, 2013: Hyperloop! Episode 138 — July 11, 2013: Quantum Leap! Episode 137 — June 19, 2013: Orson Welles! Episode 136 — May 22, 2013: Comic Strips! Episode 135 — April 17, 2013: Libertarianism! Episode 134 — March 21, 2013: M*A*S*H! Episode 133 — February 6, 2013: Punk, Part 1! Episode 132 — January 17, 2013: China, Part 1! Episode 131 — December 18, 2012: Year End Extravaganza! Episode 130 — November 29, 2012: Eugene V. Debs! Episode 129 — November 7, 2012: Vincent Price! Episode 128 — October 18, 2012: Gerry Anderson! Episode 127 — September 26, 2012: Motorcycle Movies! Episode 126 — August 30, 2012: Frank Lloyd Wright! Episode 125 — August 8, 2012: Howard Hughes! Episode 124 — July 18, 2012: Free Software! Episode 123 — June 6, 2012: Alan Turing vs. Scott Walker! Episode 122 — May 10, 2012: Conspiracy Theories, Part 10, Ancient Aliens! Episode 121 — April 12, 2012: Dr. Seuss! Episode 120 — March 15, 2012: 120 Film! Episode 119 — February 8, 2012: North Korea! Episode 118 — January 5, 2012: The Marx Brothers! Episode 117 — December 8, 2011: The War on Drugs! Episode 116 — October 20, 2011: Albert Einstein! Episode 115 — September 28, 2011: Professional Wrestling! Episode 114 — September 1, 2011: The Space Race! Episode 113 — August 10, 2011: Rupert Murdoch and Fox News! Episode 112 — July 21, 2011: Link Wray! Episode 111 — June 30, 2011: Conspiracy Theories, Part 9, Nazi UFOs! Episode 110 — June 2, 2011: Best Worst Movies! Episode 109 — May 13, 2011: George Orwell! Episode 108 — April 27, 2011: Irwin Allen! Episode 107 — March 24, 2011: Doctor Who! Episode 106 — March 3, 2011: On Wisconsin! Episode 105 — February 9, 2011: Think Tanks! Episode 104 — January 13, 2011: Jack the Ripper! Episode 103 — December 8, 2010: Great Novels! Episode 102 — November 18, 2010: Mystery Science Theater 3000! Episode 101 — November 4, 2010: Daniel Ellsberg and Wikileaks! Episode 100 — October 7, 2010: 100 Years! Episode 99 — September 9, 2010: Harry Houdini! Episode 98 — August 19, 2010: Conspiracy Theories, Part 8, Lizard People! Episode 97 — August 5, 2010: The Brady Bunch! Episode 96 — July 15, 2010: Ronald Reagan! Episode 95 — July 1, 2010: Great Movies! Episode 94 — June 10, 2010: Carl Sagan! Episode 93 — May 26, 2010: Great Music! Episode 77 — July 30, 2009: Beer! Episode 73 — May 14, 2009: Pirates! Episode 72 — April 30, 2009: Zombies! Episode 66 — January 22, 2009: Worst Presidents Ever! Episode 34 — April 26, 2007: Kurt Vonnegut, Jr. Episode 28 — January 25, 2007: 2006 Music Round-up featuring music by Tom Waits! Episode 27 — December 13, 2006: Christmas!